Good: Usable by everyone in company, regardless of BI knowledge, drag-and-drop report designer, data mashups done in real time. Bad: While available for mobile devices, ad-hoc editing is not currently supported. Bottom Line: InetSoft’s proprietary Data Block technology allows for data mashups from most data sources in real time. InetSoft’s BI solution, Style Intelligence, features InetSoft’s proprietary Data Block technology that allows for data mashups from most data sources. The data mashups are done in real-time so that users can access their information as they are available. 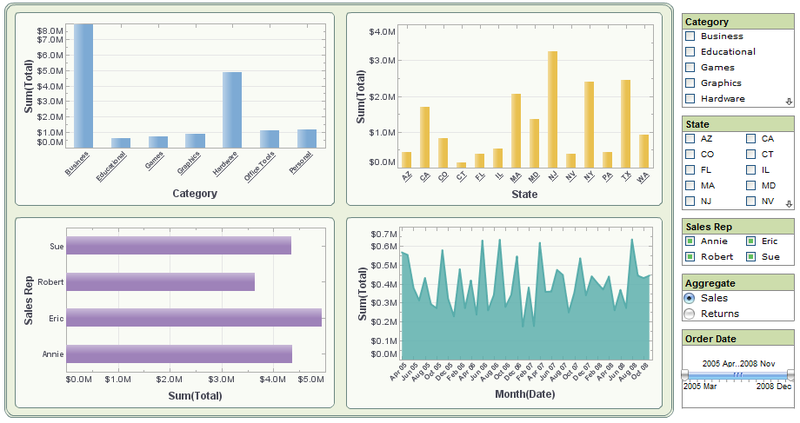 Users can customize their dashboards, including a variety of chart types (i.e. bar charts, custom geographic mapping, ec), as well as adding new data. What we like about this program is that no one needs to be an expert in BI analytics to be able to customize dashboards and reports. And the solution is aimed at specific job functions, such as Marketing, Sales, and Supply Chain. For example, Marketing can customize dashboards to track campaigns and leads. In 2015, InetSoft has launched a Style Scope Agile Edition, a free version of its BI solution. It is intended for smaller companies that can’t afford an enterprise-level solution or a large organization that has one or two dedicated BI/analytics employees. Users can conduct analyses and create dashboards and share them with others via browser or mobile device in a private setting. It is available via download on InetSoft’s site and the Amazon Web Services marketplace. Please note that this version does not include advanced features, such as data modeling, API, unlimited user licenses, and enterprise security functions. In late 2016, InetSoft launched its latest version of Style Intelligence (Version 12.2) that provides new features and enhancements, such as HTML5 technology and integration of Hadoop technology for big data. InetSoft’s BI solution’s standard analytical and reporting functions are indicated below. Additional features include advanced visualizations for data explorations, scalable production reporting, self-service functionality, drag-and-drop dashboard and report designer, small footprint Web-based server application, standalone BI application or embeddable into other Web apps or portals, and ability to access data / program from any Web browser or any mobile device. InetSoft’s customers come from a variety of different industries, such as Manufacturing, Telecom, Healthcare, Financial Services, Government, and Education. Below is a partial list. InetSoft provides a dedicated BI project management service – the prospective customer will be assigned an InetSoft project manager who will help assess the BI needs of that customer. InetSoft also provides comprehensive testing, product design and development, and on-site deployment and support. Inetsoft’s software can be set up in a matter of hours, an average time for most vendors. Once purchased, most customers take about four weeks to implement their first dashboards and reports. This could be shrunk to days if prioritized by the customer. ROI can be seen in under 6 months for most clients, assuming they are able to create dashboards and reports that automate what the company had previously been doing manually with Excel. InetSoft provides both onsite and remote training. Their training sessions comes in a variety of packages, such as Business Intelligence, Report Design, End User Dashboard and Reporting, and BI Application Administration. InetSoft recommends customers contact their account manager for more details on prices and training duration. InetSoft also provide an online customer portal for support. Customer can access the User forum as well as the Support Center for troubleshooting and other issues. The lowest price that InetSoft offers is $2,800 per year for a multi-user package. It offers various license models for clients wishing to deploy either on-premise or in the cloud. For annual subscriptions, there is a 20% annual maintenance and support charge that includes one-day turnaround for tech support and software updates throughout the year. While it’s available for mobile devices, ad hoc editing features is not currently supported. InetSoft’s future roadmap includes plans for more Big Data connectors, especially to social media platforms. Since 1996 InetSoft has been delivering easy, agile, and robust business intelligence software that makes it possible for organizations and solution providers of all sizes to deploy or embed full-featured business intelligence solutions. Application highlights include visually-compelling and interactive dashboards that ensure greater end-user adoption plus pixel-perfect report generation, scheduling, and bursting. InetSoft’s patent pending Data Block™ technology enables productive reuse of queries and a unique capability for end-user defined data mashup. This capability combined with efficient information access enabled by InetSoft’s visual analysis technologies allows maximum self-service that benefits the average business user, the IT administrator, and the developer. InetSoft solutions have been deployed at over 5,000 organizations worldwide, including 25% of Fortune 500 companies, spanning all types of industries.